One of the things we love to do is make a difference! We do that through partnerships we have across the city that are impacting people with the tangible love of God. Teen Challenge is one of the organizations in Tucson that we care about deeply. 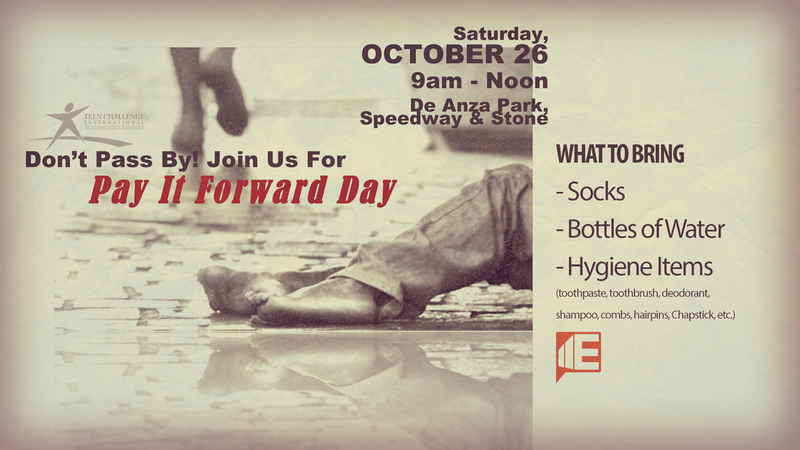 They are sponsoring an event coming at the end of October that will help the homeless within our city, so we’re rallying with them to make a difference. For the next few weeks, while you’re out and about – pick up some of the items on this list and bring it with you on Sunday’s to Elements! Items need to be delivered to Elements on or before October 20th! We’d also love to have a few of us go out and join the leaders of Teen Challenge on October 26th and assist in the distribution of these items. You’d be available to pray and converse with some of the men and women who will be there to receive them. If you’re interested in being on the team that helps distribute and pray: sign up at the HUB on Sunday’s OR you can email us at: info@elementscitychurch.org and indicate via that message. Thank you Elements family for always wanting to help make a difference!